For its opening act in an Australian retail mall, NanoLumens couldn’t have chosen a better — or bigger — stage than this. 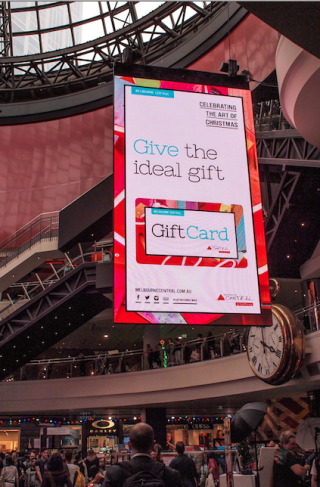 The manufacturer and marketer of indoor LED visual display solutions announced that it has installed its largest double-sided NanoSlim LED portrait sized display in the atrium of Melbourne Central, which is owned and operated by The GPT Group, an Australian property group. Melbourne Central is a landmark retail property located in the Melbourne Central Business District. GPT’s redevelopment of the retail component in 2005 converted a traditional regional shopping center into Melbourne’s premier retail, leisure and lifestyle destination. Surrounding the historic Shot Tower, Melbourne Central features contemporary fashion retailers as well as an entertainment precinct. With over 300 retailers, the shopping center covers two city blocks and is conveniently located directly above the Melbourne Central train station. The installation of NanoLumens first visual display retail solution in Australia is the culmination of a close, multi-year collaboration between NanoLumens, its regional sales representative, Digital Place Solutions, and GPT Group Divisional Director John Rankin, who was looking to create an advertising platform that would reach the thousands of people who pass through the tower each and every day. According to GPT’s John Rankin, this location is precisely what he was looking to turn into a premier advertising medium — something he was able to achieve with the NanoLumens display. “To stand out in an environment like this the display has to be extremely bright and sharp in terms of image resolution. The images themselves have to be presented in a seamless way that doesn’t detract from the marketer’s message. A key ingredient was sourcing a lightweight display solution considering the glass atrium construction and NanoLumens was ideal for this purpose. “The reliability of the display must also be guaranteed because we cannot afford to have this display be taken out of service, given its central location,” Rankin emphasized. “NanoLumens exceeded all of these requirements. I am very pleased to say that the display has been up and running since the first of December — just in time for the critically important holiday shopping season.” NanoLumens backs up its claims for reliability with a six-year, zero failure warranty.